Wait, was that snow this weekend?? This week, you can attend a Texas Legends game, engage with Frisco ISD, or get your LEGO-love on with BRICKLIVE at The Star! All of this and more… This Week in Frisco! Texas Legends: 4:00 pm at Comerica Center (formerly Dr Pepper Arena), Texas Legends vs. Iowa Wolves. Coffee Talk with District Leaders: 8:00 am – 9:00 am at Centennial HS. Frisco ISD parents are invited to share coffee and conversation with the Superintendent of Schools and a member of the School Board. Any parent is welcome to attend to ask questions or share feedback with District leaders. Dual Credit Information Night: 6:00 pm – 7:00 pm at Wakeland HS. For students in grades 8-11 and their parents. Frisco ISD and Collin College will host a series of events this spring for students and parents to learn more about dual credit opportunities in the District. Families may attend the event at their home high school or any other scheduled across the District. WEB Social – The Best of the Desk: 5:30 pm – 7:00 pm at First Bank, 4400 Main Street. Explore what desk items the fabulous business women of Frisco can’t live without – bring your favorite and leave with someone else’s! Click to learn more. Frisco ISD College Fair: 6:00 pm – 8:00 pm at Frisco High School. Frisco ISD will welcome dozens of colleges and universities from across the country to meet with students and parents about admissions. No registration is required. Texas Legends: 7:00 pm at Comerica Center (formerly Dr Pepper Arena), Texas Legends vs. Austin Spurs. Collin College Blood Drive: 9:00 am – 4:00 pm, Frisco campus of Collin College, J Building, room J-112. Collin College works hand in hand with Carter Blood Care to sponsor several blood drives during the course of the year. Schedule a time here. Texas Legends: 7:30 pm at Comerica Center (formerly Dr Pepper Arena), Texas Legends vs. Northern Arizona Suns. BRICKLIVE: January 26-27, 2019 at The Star in Frisco. BRICKLIVE will launch its first-ever event in the United States. The international LEGO® brick event will feature over 99,000 square feet of astonishing interactive exhibits, hands-on building activities, amazing live performances and incredible demonstrations for builders of all ages inside the Ford Center. Parents Night Out: 6:00 pm – 10:00 pm at Jungle Joe’s. Parents – spend an evening out and Jungle Joe’s will entertain the kids with playtime on the Jungle Structure, Arts and Crafts, games and movie time at the end of the evening. 11213 Powder Horn Lane, Frisco, TX, 75033: Stunning former model home and great for entertaining! Hardwood flooring, slate or decorative carpet and plantation shutters throughout. Handsome study and custom painted dining room off entry. Wine cellar. 6324 Chamberlyne Drive, Frisco, TX, 75034: Gorgeous home in gated Starwood. A .54 acre lot, this home has it all gorgeous views of the yard, pool, and pergola, plan shutters, central vac, 2 staircases, built-in speakers and circular drive. Chef’s kitchen. 14939 Foxbriar Lane, Frisco, TX, 75035: Wonderful open floor plan ready to move in! Beautiful tile flooring throughout downstairs. Handsome study off entry. Kitchen w granite, island w sink and storage, ss appls, brkfst bar, coffee bar, 5 burner stove. 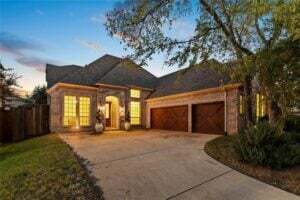 5997 Shady Oaks Drive, Frisco, TX, 75034: Former Darling model home with timeless architecture is stunning inside and out. Courtyard features a fireplace and separates the Casita from the main house. Gourmet kitchen is a chefs dream. Major League Roofing: In January, get $1,000 off roof replacements or $250 off roof rejuvenation packages or referrals with Major League Roofing. Call 469-708-ROOF or Use code lifestylefrisco online; certain restrictions apply. Growing IQ – In January, help your child discover math concepts! Book a FREE math trial class with Growing IQ and get a 15% discount by mentioning “LIFESTYLE FRISCO” when you register. Practical Fitness: In January, get 20% off any Practical Fitness packages! Practical Fitness offers 100% private, personalized, personal training sessions designed to get you to your perfect fitness outcome in 2019. TITLE Boxing Club Frisco: In January, new members mention Lifestyle Frisco and save 16% off any monthly membership. Sweets on a Stick: In January, schedule a private class and get 15% off! UP Inspired Kitchen: In January, mention Lifestyle Frisco and get 10% off your meal! The Bar Method Frisco: In January, spend $35, get $50 online. Buy a 3 class trial and get $50 towards membership or package! Good thru Jan 31, 2019. Cherry Blow Dry Bar: In January, get $50 off Hotheads® Hair Extensions when a deposit is made in January. Call to schedule a consultation. 2717Fit: Get 2 weeks free in January! Mochas and Javas: Get 50% off food items all day long on the last Saturday of the month. Plus get an EXTRA 5-15% back on top of the normal 10% when you load up on the Back-2-School Gift Card promotion Jan 18-25! BEYOND Pilates Studio: New clients, in January, make a #NewRearResolution and Get 2 Unlimited Weeks for $59. Working out will never be boring again! Sign up today. Boxcar House: In January, get 10% off of custom builds and up to 48 months interest-free financing! Ideal Dental: In January, take advantage of a complimentary new patient exam with X-Rays or Laser Teeth Whitening. Jungle Joe’s: This month, get $5 off Joe’s Cafe when ordering $10 or more! Freshii: 10% off Juice Cleanses in January! Seredipity Labs: In January, enjoy a Complimentary Day Pass OR 20% Off Your First Meeting. Soar Higher and Shine Brighter with UNT: January 28 at The Star. An exclusive event to learn about UNT’s innovative degree programs being offered now in Frisco. Dallas Cowboys Safety, Kavon Frazier, will be the guest speaker. A family event with free activities and the opportunity to speak with admissions counselors. 35th Annual Frisco Number Ones Gala “Edge of the Future”: February 1, 6:00 pm – 10:00 pm at Embassy Suites Convention Center and Spa in Frisco. An evening to honor the winning local businesses in a variety of categories. Lifestyle Frisco is HONORED to be selected as a Finalist in the “Small Business” category! Annual Daddy Daughter Dance: February 2, Frisco Convention Center. STEP RIGHT UP to “Le Cirque Fantastique” at Frisco Parks & Recreation’s annual Daddy Daughter Dance. Get dressed up in semi-formal attire and make some memories! HeartStories GNO: February 7, Bravehearted Cookie GNO! This girls night out will offer a cookie class to inspire you to follow your heart, even when you’re scared. Gather your girlfriends for a sweet night of laughter, fun, and inspiration to follow your heart, all while sipping wine, enjoying fabulous food and taking a deep breath away from the stresses of your everyday. Mayor’s Business Round Table: February 13, The first MBRT of the year, the topic of discussion is corporate social responsibility. Mayor Cheney will be discussing the necessary role of the private sector in our community and the guest panelists will discuss why CSR is not only a core value but a strategy. Valentine’s Red Carpet Concert: Celebrate February 14 VIP style! Enjoy an intimate concert featuring America’s #1 Romantic Pianist and the “Pianist to the Presidents,” David Osborne! It will be an unforgettable Night of Romance! Tickets include wine, signature cocktails, heavy hors d’oerves, and tasty desserts. Seating is limited, so get your tickets today. Casino Royale 2019: February 21 at Verona Villa. 2nd annual casino night fundraising event dedicated to our nation’s Veterans! Every dollar will go to help Veterans get back to work and to live a better quality of life.